The first “big excursion” of our 2017 Alaska trip was a guided journey by boat, on foot and by canoe to the Davidson Glacier, a few miles south of Haines. Cheryl found this tour online, and as soon as we read the description along with all the 5-star reviews on TripAdvisor, we knew we had to do it. From there, a short walk brought us to the Small Boat Harbor, where we boarded Discover, one of Alaska Excursions’ tour boats, for the 40-minute ride down the Taiya Inlet of the Lynn Canal. Along the way, we spotted the flukes of a humpback whale as it dove from the surface. 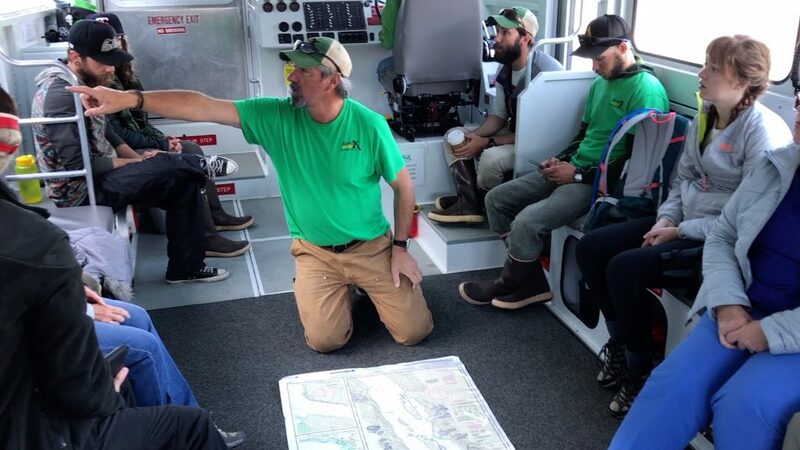 Our naturalist-guide, who also served as the ship’s first mate, unrolled a nautical chart on the deck to show us where we were headed, and pointed out many sights along the way. Discover landed on the rocky beach at Glacier Point, and we walked off the bow and met our canoe guides. After walking up to an old school bus, which took us to the company’s staging area at the edge of the forest, we traded our shoes for high-top waterproof boots, and also received personal flotation devices. Then we walked about 1/4 mile through the boreal forest, to the bank of a river, where our 31′ canoes were waiting for us. Although the canoes were equipped with small outboard motors, the river was too shallow to use them. Instead, we paddled against the current, which was especially strong in a narrow and shallow area called The Gauntlet. Just past there, the river opened into a small lake, which we motored across while enjoying the view of the Davidson Glacier in front of us and the commentary from our guide. Exiting the canoes on the other side of the lake, we walked about half a mile to the face of the glacier. Size and scale are deceiving here without any good references, and it looked like we were “almost there” the entire time. After wading across several streams of meltwater, we arrived at the glacier itself. 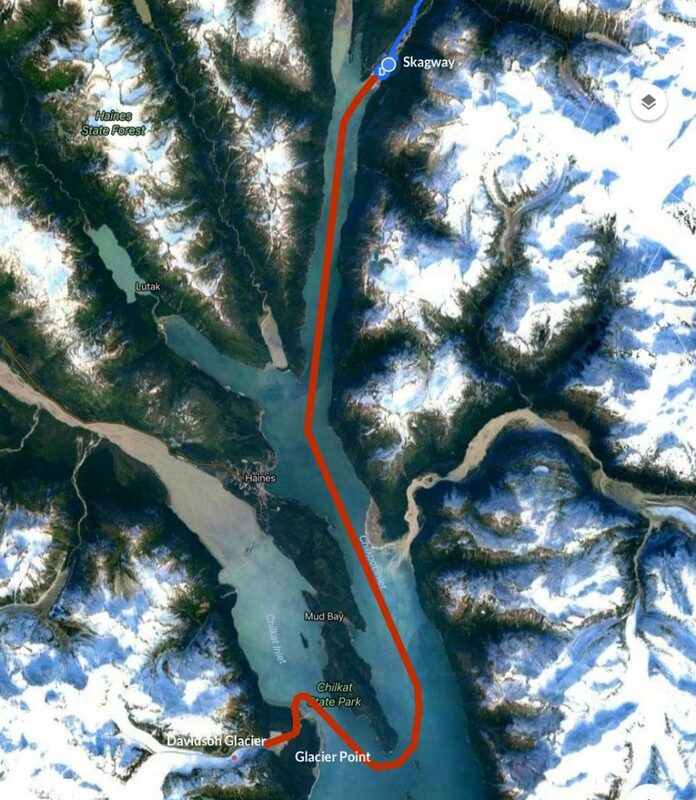 Google Earth view of Davidson Glacier, a valley glacier flowing out of the Chilkat Range. The lake and river on which we paddled our canoes is at the right-most (eastern) end of the glacier. 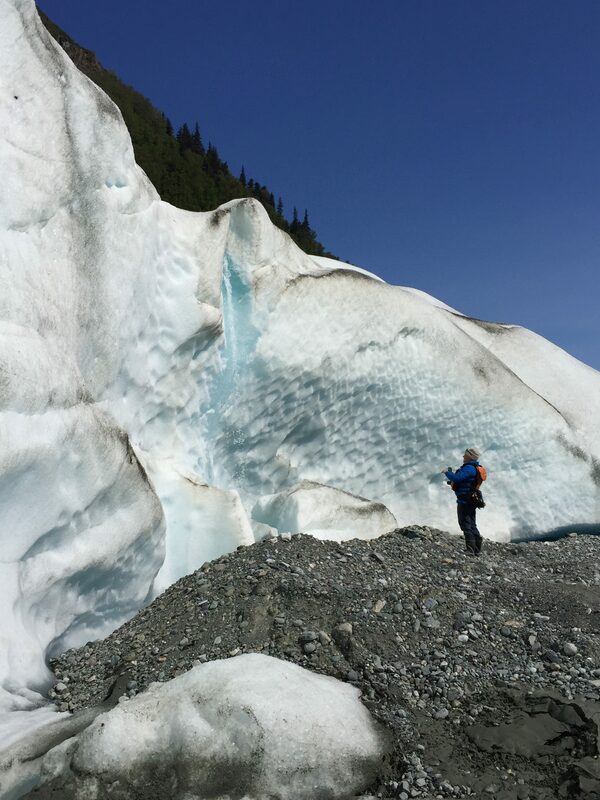 Here, we were able to explore on our own, looking underneath the glacier at the beautiful blue colors created by the purity and lack of oxygen in the dense ice, and marveling at waterfalls from melting ice atop the glacier. The Davidson Glacier is almost one thousand feet thick in the middle, and more than seven miles long; we were seeing just the very end of it. After we had plenty of time at the face of the glacier, our guides led us up the northern edge of the face. To be safe, we went up only 50 feet or so, but it was enough for us to say that we walked on the glacier! Finally, it was time to head back. We walked back to the canoes, motored across the lake, paddled into the river (much easier as we were now traveling with the current instead of against it), and walked back through the forest to the pavilion, where we exchange our PFDs and boots for a lunch of sandwiches, applesauce and trail mix. Then it was back onto the bus for the short ride to the edge of Glacier Point, where Discover picked us up for the return trip to Skagway. On the way back up the Lynn Canal, we pulled alongside a rookery filled with Stellar’s sea lions, whose grunts and growls filled the air. 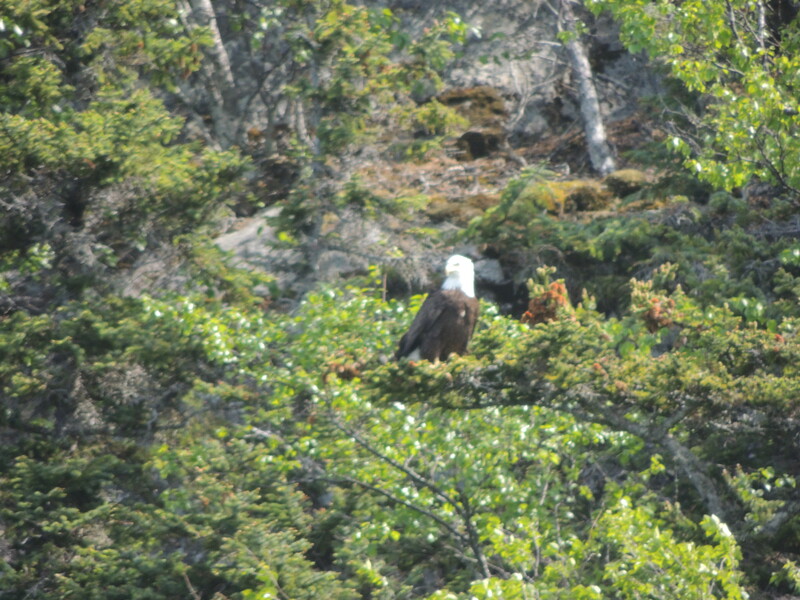 We also passed a bald eagle in its nest high atop a tree, and a large waterfall that lumberjacks once used to float logs down into the water. Don’t miss watching the video at the top of this post–it’s the only way to really appreciate the beauty of this area, other than taking the tour yourself. 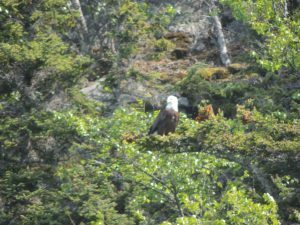 We highly recommend Alaska Excursions and their Glacier Point Wilderness Safari if you’re in Skagway, either on a cruise or in an RV, as a way to see the “real Alaska”!